The creativity of Molton Brown perfumers will never cease to amaze me. Normally I don’t associate plums with winter holidays, but as soon as saw the rich burgundy and silver shimmer packaging and inhaled the sweet & fruity aroma of the body lotion, I was sold. With Molton Brown, every scent is a journey, and the new Muddled Plum Collection is taking us to Sussex where the decadent Victoria plums are grown and harvested. I really like how the sweetness of the plums is paired with boozy rum notes here, while saffron, elemi, and sandalwood add depth and sophistication. Is it sweet? Is it spicy? Maybe even a little milky? Really, the answer is “yes” to all of them. As always, the body wash was the main standout for me personally. I said it before and I’ll say it again, there is nothing like a Molton Brown shower. These body washes are incredible! They turn every shower into an experience, and most of them leave the skin smelling heavenly. 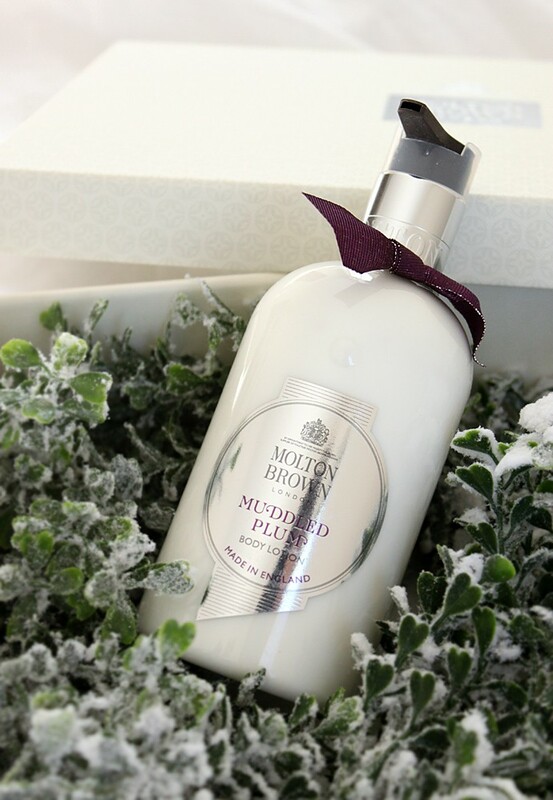 Molton Brown Muddled Plum Bath & Shower Gel ($35) is no exception. Paired with the Muddled Plum Body Lotion ($44) from the same collection I could easily skip perfume and my skin will still smell amazing all day. The lotion has a lightweight, milky texture and sinks in quickly without leaving a residue. If your skin is extremely dry, I would not recommend it as your only winter lotion because it’s just too light to provide any substantial moisture. I think of it as an extension of my fragrance, kind of like layering it to control the scent intensity or make it even more long-lasting. Longevity is not one of the main traits of the new Molton Brown Muddled Plum Eau de Toilette ($65), which can be a good thing or a bad thing depending on your preference. If you like mild, airy, ephemeral fragrances that stay within your personal space, then you will enjoy this one – it doesn’t travel far at all. On the other hand, if you are someone who likes to make your presence known by wearing bolder and stronger scents, then perhaps is not the best choice. Even though Muddled Plum is a very lovely fragrance, the potency and the longevity are more on a subtle side. I find the combination of body wash plus body lotion to be stronger than just the EDT alone, so keep that in mind before you decide to spend $65 on a bottle. Muddled Plum is not really a perfumey kind of fragrance. It smells like something edible, or drinkable. It’s quite versatile and won’t be out of place in a cozy snowed-in cabin or at a fancy cocktail party. My taste buds instantly recognize saffron, plums, and rum, while my nose can never get enough of the sandalwood and elemi oil. The complete bouquet also includes orange, benzoin, and musk, which are all easily detectable as well. Molton Brown also sent me a bottle of Muddled Plum Scented Glitter ($45), but I am just not a glitter person at all, so I decided not to test it. In theory, this perfumed biodegradable glitter is used to sprinkle over the potpourri, centerpieces, Christmas tree, gifts, or holiday cards to add festive sparkle and further extend the Muddled Plum fragrance. I love the idea but hate the thought of trying to vacuum out the glitter if Luna decides to play with pinecones in the potpourri bowl again. If you love glitter and don’t have potentially destructive roommates, then it’s probably worth trying. This is definitely a decorating trick I hadn’t considered before. 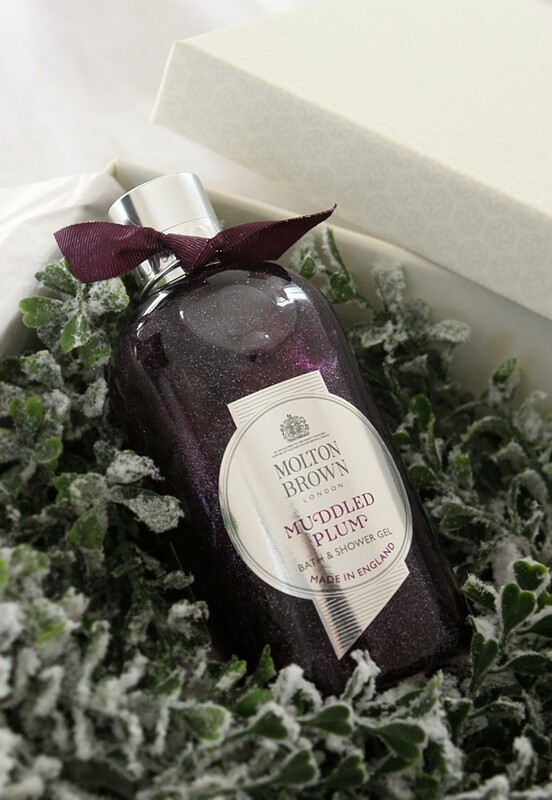 Molton Brown Muddle Plum Collection is a Limited Edition release for Holiday 2018 and includes Eau de Toilette, Bath & Shower Gel, Scented Glitter, Body Lotion, Festive Bauble, and Scented Candle. 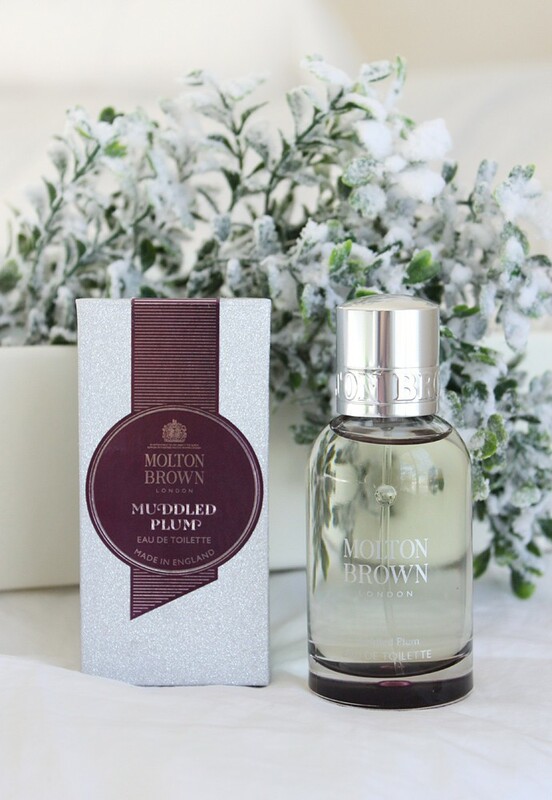 Have you tried Molton Brown fragrances before? Do you have anything from the brand on your wishlist? Which fragrance notes do you typically associate with winter holidays? Let me know in the comments below!